When it came to the last year of high school, I didn’t really know what I wanted to do after graduation. I didn’t feel ready for college and, besides, looking at my older sister getting stressed out with her college classes didn’t appeal to me very much. Also, I didn’t want to work at a fast food restaurant just to get on my feet. I contemplated the military, as my Dad always had said that if we didn’t know what we wanted to do after high school, the military was a great option to do something with your life. A few months before my sister and I graduated, she decided to enlist in the Navy and I thought that was a good idea and I decided to go into the service with her. So, we went to boot camp together. My Dad made a career in the Air Force serving as a Flight Test Engineer on the C-141 Starlifter. He is a Vietnam Veteran and has been all over the world. My dad’s love for the military influenced my decision to join the military as well. I’m glad I did. 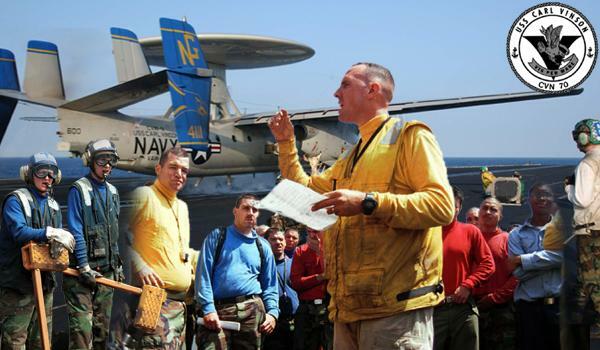 I enlisted as an un-designated airman and after boot camp, received orders to be Ship’s Company on board the aircraft carrier, the USS Carl Vinson (CVN-70), then stationed in Bremerton, Washington. It had recently relocated from Alameda, California to Puget Sound Naval Shipyard in Washington State. Truthfully, I was bummed to see that Alameda was crossed out on my orders because I was from the San Francisco Bay Area and would have been stationed right at home. After spending a couple weeks with my Mom for the holiday, I flew out to Washington State to my duty station. I was among the second group of females that had arrived on board when the ship was transitioning from an all-male force to co-ed in January 1998. The first group had arrived four months prior so when I came on board, things were still in transition to accommodate females on board the ship. I was shocked to see this huge 101,300 long ton steel vessel that I was going to live on for the next four years! What a sight to see for a young, 18-year-old girl leaving home for the first time. Shortly after settling in and serving ninety days in the Galley, I was moved into the V-2 Launch and Recovery Division, first in the Administration office and then into the work center where we handled the Pilot Landing Aid Television and Fresnel Lens Optical System. I spent a lot of time learning the IC rate and fixing headphones. I loved working in that shop. It was the best part of V-2. 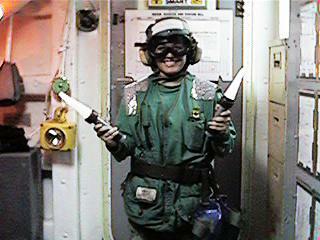 However, when the time came to advance to an E-4 as a Third Class Petty Officer, I decided to stay in V-2 as an Aviation Boatswain’s Mate Launch and Recovery Technician and ended up moving into the Waist Catapult Work Center, operating and maintaining mechanical and hydraulic launch equipment on the flight deck. It was very intense, often harsh and no place for weak-minded individuals. It was more so peacetime operations. We were operating under Operation Southern Watch, monitoring and controlling airspace south of the 32nd Parallel in Iraq and Operation Northern Watch, a US European Command Combined Task Force (CTF) charged with enforcing its own no-fly zone above the 36th parallel in Iraq. We also participated in a four-day bombing campaign on Iraqi targets in support of Operation Desert Fox in response to Iraq’s failure to comply with the United Nations Security Council resolutions as well as their interference with United Nations Special Commission Inspectors. There is not one memory that I can recall that has made the biggest impact on me. If anything, I would say that serving four years on board a floating city and working in one of the toughest and often overworked areas in the Air Department had the biggest impact on me because it made me build up tough skin to handle all the pressures of life. The Navy helped me to look at life from a different perspective than where I was before living a life in uniform. It was a hectic, crazy and challenging roller coaster ride but overall, an experience I am grateful for. I gained knowledge, a variety of training and a level of maturity only the military could mold a then 21-year-old, young woman into. I had left with a poignant experience that left me with mixed emotions. It was the most trying four years of my life. I met friends that I’ll never forget and I learned the meaning of brotherhood and camaraderie only gained from being in the military. I also left with a bitterness that took me over three years to heal. All in all, my experience left me with a love and appreciation of the Navy life and for V-2. WERE ANY OF THE MEDALS OR AWARDS YOU RECEIVED FOR VALOR? IF YES, COULD YOU DESCRIBE HOW THIS WAS EARNED? Well, due to the time in which I served, I did not have the opportunity to receive awards for valor as I was not serving in combat conditions nor had I been in harm’s way. The most meaningful badge or device to receive would be the Navy Good Conduct Medal. There is a lot of history behind this medal. As one of the oldest medals awarded to active duty members in the Navy, this one means the most due to the honor and privilege of being commended for honorable and faithful service. I’m grateful and humbled to be awarded and recognized for creditable, above average professional performance, military behavior, leadership, military appearance and adaptability based on good conduct and faithful service for a three-year period of continuous active service. (Medals of America DD-214 Blog, 2011) . The military can be such a tough and trying lifestyle and to serve without any disciplinary, non-judicial-related infractions is a challenge in itself. The military can test your will, character and faith and if you’re not grounded in who you are and if you don’t have a strong foundation of a solid up-bringing, you might become susceptible to certain unlawful pressures. I’ve seen it firsthand how many people have made wrong and poor decisions for a fleeting moment of pleasure and it cost them their service and all the time that they put into their enlistment. The person I would say that had the most positive influence on me through the toughest part of my tour was Chaplain Frazier. Due to working in V-2 and the constant challenge with not having enough qualified personnel and the demand of carrier operations, the pressure and life of living on board a floating city was mentally, physically and spiritually exhausting. I sought spiritual refreshment and strength through Chaplain Frazier and he helped me to endure the last couple of years by providing prayer, guidance and support. At the time, I was working about twenty-two hours a day out to sea and living off of two hours of sleep a night. The Chapel and the Chaplain’s Office was my place of solitude to find rest and peace. We were out to sea conducting Cyclic Operations, in which we were in a constant rotating take-off and landing pattern to maximize the flight deck. Each day, cyclic air operations occur for 12 to 14 hours, in 8 to 9 cycles of approximately 20 aircraft. Each cycle takes about an hour and forty five minutes, from take-off to landing, with just 10 minutes needed to launch outgoing aircraft and 20 minutes to recover incoming aircraft. So, needless to say, we were in high ops tempo operations. We were scurrying to prep the Landing Area (where Cat 3 and Cat 4 are located) after launching aircraft. A plane was on the “ball” coming in for a landing and we were “tying” down the cat with steel buttons to keep the arresting wire and other FOD material from getting in-between the insert of the catapult. In the midst of the adrenaline rush, and my supervisor yelling at us to hurry up, I got up and started running toward the catwalk when I slipped on Cat 3 and fell due to the mixture of steam and grease. 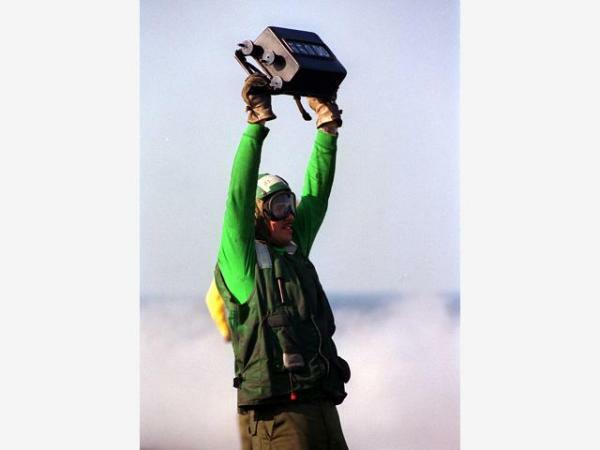 The Air Boss noticed the incident while manned up in the Tower calling out the landing. As quickly as I fell, I bounced right back up and got under the deck in time for the aircraft to land without incident. It was a funny moment in-between the adrenaline rush and the push to launch and recover. 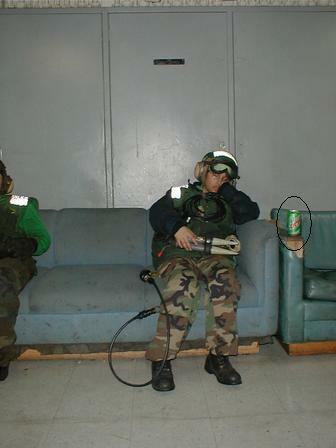 Four days after I was honorably discharged, the events of September 11th unfolded. I wanted to go back into the military but fearing I would be stationed on board an aircraft carrier once again, I decided to enlist in the Air Force. So, I crossed branches and served for a ew years before getting out. 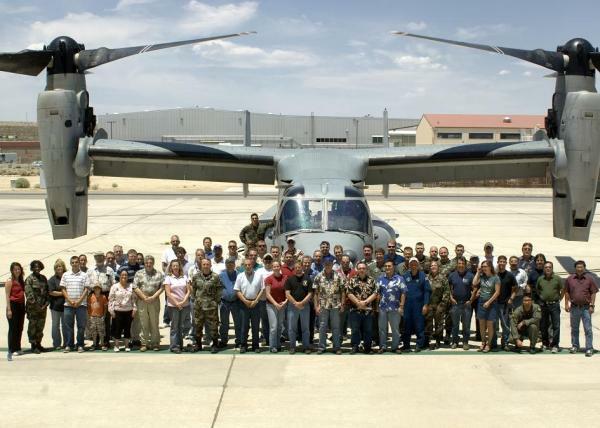 Then, I landed a job as a contractor at Edwards Air Force Base working in the CV-22 Osprey Integrated Test Team program for a couple of years as a Flight Operations Scheduler. Then the CV-22 program ended, I was unemployed for a while, until I landed a scheduling job for the Predator UAV working for General Atomics Aeronautical. I worked there for a couple of years assisting with DCMA Flight Authorization approvals, student pilot training, and working for the Aviation Safety Official until I recently landed a job as a DOD civilian back at the base. Now, I work as a secretary at the Air Force Research Laboratory. I have always wanted to stay along the paths of the military community and I thank God for the opportunity to venture in all types of areas as a military member, contractor and now a civilian. 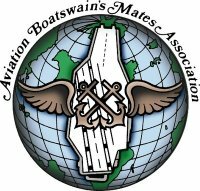 I joined the Aviation Boatswain’s Mate Association in 2009; however, I haven’t had the chance to invest the time and resources in staying active due to a busy and hectic lifestyle working two jobs and going to school, pursuing a BA in Organizational Management at Ashford University. Serving my country is part of a proud, family heritage and it has made me a stronger and better person. I have learned to live a disciplined lifestyle and have learned to appreciate what it really means to live a sacrificial life in devotion to God, country, and fellow American citizens. Through the military, I have developed interpersonal and leadership skills and training. I have gained an understanding of politics and life and I understand what it means to have to be deployed away from home and family as well as everything that is American. I have learned to appreciate our American way of life and all of its freedoms and luxuries. I have such love, respect and appreciation for all we sacrifice and go through living the uniformed life. Appreciate every moment, whether good or bad. Keep your chin up through the bad and the ugly and never lose faith that what you’re doing doesn’t count for something. Learn from your mistakes and don’t repeat them. Take advantage of everything the military offers. Cherish the friendships you make. Cherish every aspect of life in uniform because you only experience things once-in-a-lifetime. Don’t take wearing your uniform for granted. What you go through is not just so you can be shaped into a better person but it is also for someone else. Wear that uniform with appreciation and be a model for someone else to model after. One day, you’ll look back and see how much you’ve endured and you’ll see who the person you have become today as a result. You are important. You are a member of one whole body fitly joined together so that every joint may supply. TogetherWeServed.com has helped maintain a bond with the service and those I have served with by providing a community to connect to other members outside of a military locator. Prior to social networks, if you were not active duty, there wasn’t much of a chance to locate someone without having to look at a Global Address List or locate someone through a contact that is still actively serving. Through TogetherWeServed.com, I can maintain contact with former comrades and yet meet new people as well. I’ve already had the pleasure of meeting such fine fellow service members who I have never served with and yet am so glad to know. It is an excellent place to connect. I hope that my contribution will help other women as well. It’s time that we share our stories and make our voices heard as women who are and have served in the military!